On Saturday, that one word could accurately describe a handful of Longhorns after the final day of the Texas Relays. Rushelle Burton ran two races in an hour. John Burt hurdled on the same day he had a football scrimmage. John Rice and Sam Worley capped a long week with another long run. For the host school, Burton and freshman Tripp Piperi were the day’s big winners. Burton became UT’s first woman to emerge victorious from the 100-meter hurdles since 2005. Piperi took home the Section A shot put with a toss of 64 feet, 3¾ inches. After earning her event’s third-fastest qualifying time a day earlier, Burton was clocked at 12.64 seconds on Saturday. 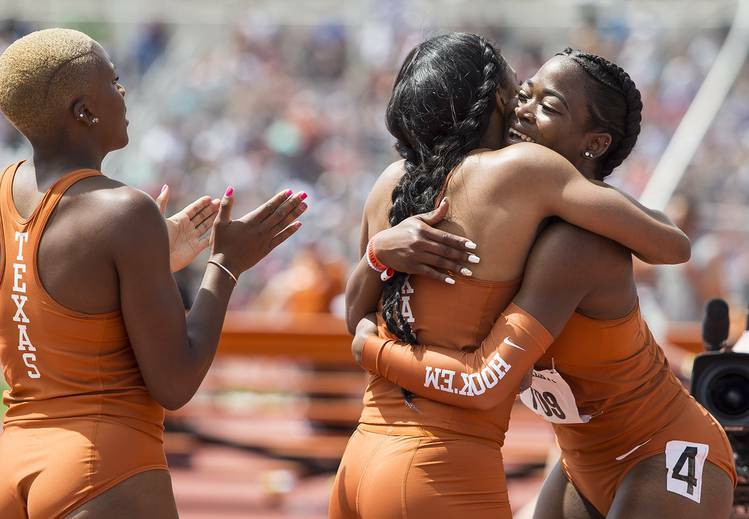 That was good enough to edge LSU’s Tonea Marshall (12.73) and fellow Longhorn Pedrya Seymour (12.85). Less than an hour before her gold-winning race, Burton had run the anchor leg for UT’s 400-meter relay team. After she finished the relay race, Burton began worrying about her right hamstring. Ahead of her hurdles heat, she sat down by the track and contemplated whether she would be able to compete. Former UT standout Morolake Akinosun, though, was around to give her a pep talk. Using her leg in the relay race as a warmup, Burton said it was her goal to beat the field to the first two hurdles. During the race, she found herself paying attention to the public address announcer. But she was able to tune out her surroundings until she reached the finish line. Burt finished second in a 110-meter hurdles invitational competition. He ran 13.96 seconds Saturday, which bested the 14.25-second performance he posted Friday in a qualifier for the meet’s collegiate competition. Burt juggled track and football workouts throughout the week, and he participated on a limited basis in a football scrimmage Saturday morning. The Longhorns were kept off the medal stand in the Jerry Thompson Mile, which Worley won last year as a high school senior. Worley finished sixth, a result that was excused by the 1,200-meter leg he ran for UT’s distance medley team Friday night. Thanks to Worley’s strong start, Texas claimed a victory in the distance medley. Rice acted as the pace-setter in the mile, and he pulled out of the race midway through the third lap. Rice had won the 3,000-meter steeplechase Thursday. The Longhorns will return to Myers Stadium for the Texas Invitational on April 13-14.